Save $30.00. Buy as low as $39.99 per box. 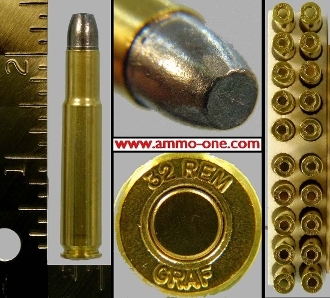 One Box of 20 Cartridges: .32 Remington Auto, new production using new brass a cases loaded with a 170 grain lead projectile, for better use in the Remington Model 8 pump rifle. Loaded to SAAMI Specs. If any issues, returns go to P.C.I. for replacement, not us. Please note: These cartridge will work in the Remington Model 8 pump rifle due to the blunt end lead projectile, in addition to the Remington semi-automatic rifles.